Recorded crime in England and Wales fell by 9% from July to September last year compared with the same period in the previous year. The Home Office said there was a 4% rise in gun crime during the third quarter of 2007 compared with the same period in 2006. 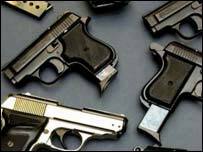 There were 10,182 firearms offences in the year to September, compared with 9,755 in the previous year. The number of recorded drug offences rose by 21% in the 2007 third quarter. The quarterly statistics of recorded crime reported that violence against the person fell by 8% and robbery by 17%. The figures also showed that during the 12 months to September there were six fewer gun-related deaths and that serious injuries from guns had dropped by 16% to 368. But the 4% overall rise in gun crime was made up of a 4% rise in slight injuries to 2,728, and a 6% rise in threats and incidents that did not result in injury. However, the Home Office also said that according to the British Crime Survey (BCS) - which is a separate set of figures based on interviews with members of the public - crime in England and Wales remains stable. The Home Office said: "For the crime types it covers, the BCS provides a more reliable measure of trends in crime as it has a consistent methodology and is unaffected by changes in levels of reporting to the police, recording practice or police activity." Home Secretary Jacqui Smith said: "These latest crime figures contain some excellent results and I am particularly pleased that the risk of being a victim of crime is now at a historically low level. "Enforcement is key part of our approach to tackling drug harm and I welcome further evidence that police are maintaining a tight grip on drugs offending." She added: "In 2008 we will tighten our grip on violence and anti-social behaviour, working with police and local partners." Where is it safe to walk the streets?